One Sentence: Clint Eastwood can't ride a horse. Best Movie of 1992. This was right when I started paying a little more attention to the movies. Aware of who was a winner, and what was going on with the box office. I never saw this movie as it was before I really got into them. I don't like westerns as a general rule, but they seem to be growing on me. Every one I watch I seem to like. So I guess I just don't think I like westerns, but I might. I think western, and I think of whooping Indians, and silly sherrif's who ride in to save the day. I think these types are the stereotyped movies that I have always seen previews of, and never seemed interesting to me. But every western I rent, I really like. Maybe I will rent more. There are no whopping indians, no gold rushes, no gun battles at high noon. This was a story, of a man, and his past. A story of corruption and violence. What drives a man to do things, and can you ever get away from your past. I found it to be an excellent story. Simple, cold, and true. The simplicity of the people in the story, and thier lives made it all seem so real. Many called it the best western ever made. I have not seen enough to make that call. I would say that I enojoyed this movie quite a bit, but I would not give it a 5. In 1992, the other movies nominated for an Academy Award were, Howard's End, A Few Good Men, The Crying Game, and Scent of a Woman. I have not seen 2 of those, but if it were me, I would have awarded A Few Good Men with the oscar. 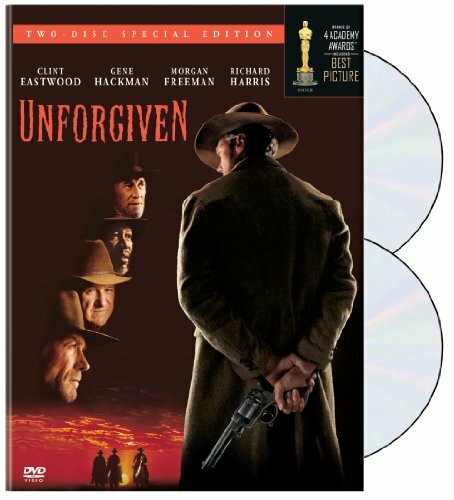 I found it to be better than Unforgiven. But it was no slouch. If you haven't rented it, add it to the queue. It was quite worth the rental.